In this post we celebrate lots of local from salami and spice, to coffee and bone broth. Plus, I’ve included a great recipe for Braised Beef Shanks you are going to love. I hope you will share this post, and when you do remember to say #IllHaveWhatHeidisHaving. One of the things I love about these Eat Local Drink Local features is the story behind each of the products. Let’s start today with the story of Sun-Raised Foods. A wonderful tale of sustainability and cooperative farming. And, it goes to the point that when we work together, wonderful things ( like Southern Lamb Salami) are the result. Sun-Raised Farms is a lawn maintenance company for solar panel farms in North Carolina. To make their work sustainable, the company teams up with sheep farmers across the state, connecting each solar farm with a herd of sheep. The sheep live on the solar panel farm (often tucking under the panels for an afternoon nap or when they are in need of shade). When they get hungry, the sheep graze the property, keeping the grasses in and around the solar panels in check. Currently Sun-Raised Farms grazes and maintains over a 1000 acres of solar farms in the state of North Carolina. Sun-Raised Foods, a division of Sun-Raised Farms, is the retail resource for the lamb harvested from these herds. They work with the farmers to sell fresh local lamb and the company’s signature slow cured Southern lamb salamis. Made of 80% lamb and 20% pasture-raised Pork, these all-natural salami’s are nitrate-free. The salami is crafted by a local third-generation salumiere using traditional recipes and classic Italian techniques. Sun-Raised Foods Lamb salami comes in three classic flavors ( each with a slightly Southern twist on the classic name): Carolina Classico, Sunny Milano and Southern Sopressata. While Sun-Raised Farms has been in business since 2012, Sun-Raised Foods is a relatively new local company. The salami’s are not yet available in retail stores, but I am excited to share that you can shop online. The company is launching their new website this week. Sign up for their mailing list and order their lamb salami direct at SunRaisedFoods.com . In Case you missed it – here is a copy of the video. 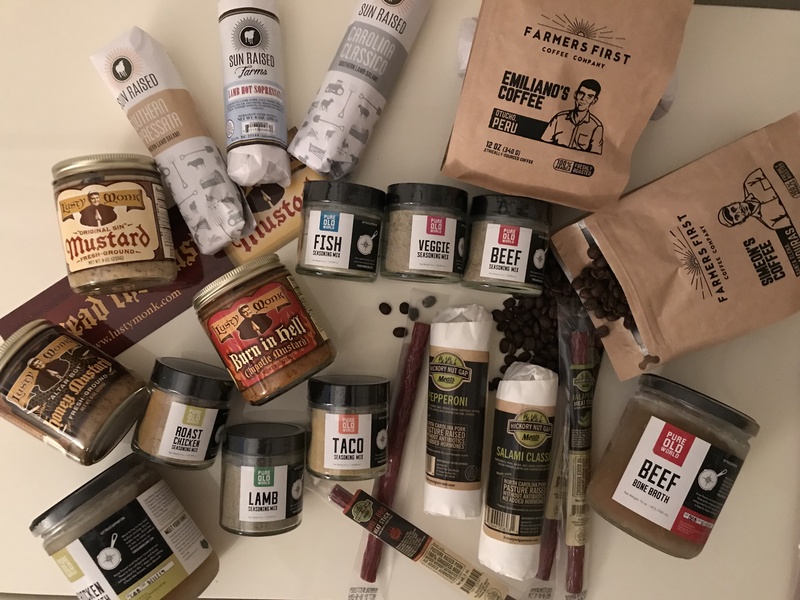 Take a look and then read more about each of these GotToBeNC products below to get more details and the scoop on where-to-buy to stock your pantry, fridge and freezer with some great ways to eat local. Because you can’t have salami or a charcuterie platter without the condiments there is Lusty Monk Mustard, made in Candler NC. This hand crafted is not only a great condiment but consider it a go-to ingredient for stocks, sauces and marinades. Lusty Monk is available in three flavor variations on its classic stone-ground variety called Original Sin. For a sweeter spin on things try the Altar Boy Honey Mustard. Spice it up with Burn In Hell Chipotle Mustard. All of Lusty Monk mustards are fresh ground and made in small batches to insure quality and flavor. Family owned and nationally recognized, this award-winning mustard is made with all natural ingredients. Lusty Monk Mustards are available across the state and across the country. In Charlotte, look for Lusty Monk at all three locations of Pasta & Provisions, at Earthfare, and Orrman’s Cheese Shop in 7th Street Station. It is also on the shelves in the All Natural Foods booth in Building B of Charlotte Regional Farmers’ Market. Or, order direct online, along with fun LM swag and “MonkWear”, at the Lusty Monk website. I came across the Pure Old World table at the Matthews Community Farmers’ Market, next to my friends at Dancing Bees Honey. It was the bone broth that first attracted me. Making real bone broth is an intensive labor of love. The process can take up to 48 hours; and that’s after you are able to source bones from a sustainable source. Trevor & Brittany at Pure Old World makes the process easy by doing the work for us. Pure Old World bone broths are frozen in pint jars, ready to defrost and use. There isn’t anything in any of the broths that you can’t pronounce or wouldn’t want to enjoy on a regular basis. Sustainable ingredients include Reverse Osmosis Water, Organic Carrots, Organic Onions, Organic Ginger Powder, Organic turmeric powder, Organic Garlic Powder, Sea Salt, Organic Dried Basil, and Organic Bay Leaves. Plus, of course, the addition of Grass Fed and Finished Beef Bones, Pasture-Raised chicken bones and ( my personal favorite) Grass Fed and Finished Water Buffalo Bones.The bones for each batch of broth are of single local farm origin. The name of the featured farm is on every jar. One taste, (Yes, Trevor offers samples at the Saturday morning market) and I knew these broths would be a game changer for me. What I didn’t realize it how much I would enjoy the six spice blends Trevor also produces at Pure Old World. Again, its all organic and hand-ground in small batches. Trevor works with six different flavor profiles – one for each blend. But, don’t limit your use of these spice blends to the name on the jar. Depending on what you are cooking, you’ll used these blends in all of your salad dressings, marinades, for roasts in the oven and seafood, chicken and veggies on the grill. Currently Pure Old World Spices are only available on Saturday mornings at the Matthews Community Farmers’ Market. The company is still new and beginning to grow. In the months ahead look for Pure Old World to be available in more local shops and markets keep up with all that is new at Pure Old World on their website. More Delicious local at Hickory Nut Gap Farms: Salami, Pepperoni, Beef sticks and Grass Fed Certified Organic Beef, too! Next, in the line up of today’s five fabulous ways to Eat Local is a farm with lots of local to enjoy. Hickory Nut Gap Farms is fourth generation family farm in Fairview, NC. Realizing the importance of agritourism across the state – that is, opening to the public for tours, activities, and events throughout the year, Jamie and Amy Ager who now run the farm, shifted the focus at Hickory Nut Gap several years ago. They continue to farm but also keep their doors open to visitors share the concept of sustainable farming and responsible land stewardship with the community. In Charlotte, Hickory Nut Gap’s grass-fed beef is available every day at the SouthPark location of Whole Foods. Now, you don’t have to wait till a Saturday morning Farmers’ Market to eat local all week long. I recently purchased some of the HNG beef shanks in the meat case at Whole Foods to showcase with this post.Braising is a great way to cook this fall and you can include Lusty Monk Mustard and Pure Old World Spices in the mix of ingredients. Simply season the beef (I used Outerbanks Sea Salt, a blend of peppercorns and Pure Old World Beef Seasoning mix.) Saute just until the beef is browned in your favorite EVOO – the mushroom and sage infused blend from Pour Olive on East Blvd is delicious here. Once the shanks are browned, add just enough canned organic tomatoes and beef broth (or Water buffalo broth) to cover the shanks. Add 3-4 Tbsp. of Original Sin Lusty Monk Mustard, several springs of fresh thyme and rosemary and some organic carrots and sliced onions, if you would like. Bring the liquid to a boil. Cover the pan and reduce temperature. Let the liquid and the beef braise (think simmer) for about 1 1/2 hours. Enjoy. HNG has Cured Meats and Salamis, too. My husband Tom and I were recently at a tasting at Addison Farm Vineyards in Leicester NC while on a trip to Asheville. At the winery, I had the pleasure to meet Jamie and Amy who were there for a farm dinner. I also discovered that Hickory Nut Gap produces a line of farmstead charcuterie which includes delicious salamis, pepperoni and beef sticks. These local cured meats are for sale at the winery to take home. Or, enjoy them on a charcuterie platter as you sip and swirl. I just knew I had to include them all in this Eat Local post. There are three varieties: Hot Sopressata, Salami Classico and a divine local Pepperoni. You can order them directly from Hickory Nut Gap here. As for the agritourism side of things, here’s a list of all the fun on-the-farm happenings at Hickory Nut Gap this fall. Be sure and stay tuned for info on the farm’s Sausage Fest on November 1, 2018. Meanwhile enjoy these Fall farm Festivities on your next visit (Sept 1-Oct 31): Daily corn maze, grass maze, toddler hay bale maze, hay pile, corn silo, trikes, baby farm animals, farm scavenger hunt, spider web climb, pumpkin patch, culvert slides. Weekend Extras: Horseback rides, hay rides and kiddie cart rides. Check the website for details. One of the things I love about the way this Eat Local Drink Local post has come together is that, for each of these local brands, its all about the farmers. So true for our one Drink Local entry this round: Farmers’ First Coffee. The beans are not local, of course, they are grown at coffee plantations in Honduras and Peru. They beans are roasted and packaged locally in Kings Mountain, NC. Each package is a tribute to a single coffee farmer.Even with Fair Trade practices associated with the coffee business, farmers still don’t realize much income. With Farmers First, co-founders Matt and Robert wanted to make a difference. They made it a tenant of their business to put the farmers first, seeing that they were paid more that just a living wage. Each farmer supplying coffee to Farmers First is paid four times the going wage in the way of a bonus. This way the coffee wholesaler/importer can give back. And the coffee growers can not only make a living but plan for the future as well.With each purchase of Farmers’ First coffee, you’ll find the individual farmers name and photo on the package. To make it even more of a personal connection each farmer has a trading card with the story of the coffee harvest you have brewing in your cup.Farmers’ First coffees are available by the pound at all locations of Charlotte’s Pasta & Provisions in Charlotte, at Coddle Creek Farms farm store in Mooresville, at Common Market and at Laurel Market both in Charlotte. For more locations in the area and to read more about Farmers’ First – check out their website here. I try hard to practice what I preach. I’m a big believer in the benefits of eating and drinking local product. Its good for use and for our local economy. Did you know that every LOCAL purchase you make gives 30 percent more back to our economy? That’s one of the reasons I write about local products; and feature them in my cooking classes, when I cater and when I cook at home, too.Plus, it just feels better when the farmers and local producers you buy from are your friends. Always good to know where your food comes from and to know that local products are sustainably sourced.Want to know more? First, sign up to follow this blog so you’ll get my posts in your inbox as soon as they hit. Then, call your friends, check your calendars and Sign up for any one of my fall cooking classes – or reach out to plan a private class all your own. Know that this quarter, I am donating 10% of the profits from each class to Hurricane Florence relief. Finally, let me help you entertain. Give me a shout about planning your next party. It’s never too early or too last minute to get a date on the calendar. If you need live music at your party, (we think this is a really good idea!) my husband Tom Billotto is your answer. Tom is an accomplished, full time acoustic guitarist and vocalist. His repertoire includes Jazz Standards, James Taylor, The Beatles, his own well-crafted originals and more.Together we are delighted to provide “Food and Mood” for your next get-together, dinner with friends, birthday party, cocktail party or holiday soiree.You can reach me at Heidi@HeidiCooks.com – can’t wait to hear from you soon!